We provide certain information about our products and services and certain other third party information on the Website. We may add, delete or modify some or all of our services and information at any time. This Website is available for use only to individuals who can form legally binding contracts under applicable law, and thus, is not available to minors under the age of 18. By using this Website, you represent that you are of sufficient legal age to use this Website and that you are able to create binding legal obligations for any liability you may incur as a result of the use of this Website. Information on the Website is provided “AS IS” and may contain technical inaccuracies or typographical errors. Ramsey Group does not guarantee and is not responsible for the accuracy of any links to information provided on the Website, including but not limited to articles and regulations, and we do not guarantee that any such information is current. Information may be changed or updated without notice. Ramsey Group may also make improvements and/or changes in the products and services described on the Website at any time without notice. Any information contained on the Website does not represent a commitment on the part of Ramsey Group to provide such information or comparable information in the future. You may not transmit to or introduce at the Website any viruses or harmful software, program, code, utility, material, routine or material or thing intended to damage, interfere with, disrupt, intercept or expropriate the Website or the data and/or information contained in the Website or any other system, program, network website, data, information, or activities associated with those terms (“Viruses.”) You may not use any device, software, routine, or malicious code, or otherwise implement or engage in on-line activities, attacks or actions in a manner that involves, or with a purpose of creating, a disruptive, surreptitious, detrimental, or otherwise harmful effect, including without limitation, by excessive use of scripts, sound waves, scrolling, or by means of hacking, or denial of service event (“System Attacks”). Further, you may not take any action which imposes an unreasonable or disproportionately large load on our infrastructure, including but not limited to “spam” or any other such unsolicited overload technique. The Website may contain links to third-party websites not under the control or operation of Ramsey Group. When we provide links, we do so only as a convenience and do not endorse and are not responsible for the contents of any linked site or any link contained in a linked site. Any such link does not and is not intended to create or constitute any legal affiliation or relationship between Ramsey Group and any other person, company or entity which owns or operates a linked site, or any liability or responsibility on the part of Ramsey Group for such third parties, all of which Ramsey Group hereby expressly disclaims. Ramsey Group makes no representations or warranties regarding any linked site or the content, information, advertising, products, services or other materials contained on any linked site(s). If you decide to access any linked site, you do so at your own risk. Unless you have a written agreement in effect with us which states otherwise, you may only provide a hypertext link to the Website on another website, if you comply with all of the following: (a) the link must be a text-only link clearly marked “Ramsey Group ” or “www. ramsey-group.com”; (b) the link, when activated by a user, must display the Website full-screen and not within a “frame” on the linking website; and (c) the appearance, position and other aspects of the link must not be such as to damage or dilute the goodwill associated with our name and trademarks or create the false appearance we are associated with or sponsor the linking website. We reserve the right to revoke our consent to any link or to require any website containing a hyperlink to our Website to remove said hyperlink at any time at our sole discretion. You will be required to provide certain personal information in order to become a Registered User of the Website. If, at any time, Ramsey Group requires registration in order to access or use any areas or information on this Website and/or if you are or become a Registered User of this Website, you agree to (a) provide true, complete, accurate and current data and personal information, as requested in the registration process (“the Registration Data”): (b) maintain and update the Registration Data as required herein; (c) prevent unauthorized access or use by you or others by use of your user identification number and/or passwords; (d) report any unauthorized use or disclosure of your password or other breach of Website security; and (e) not assign or transfer (or attempt to do the same) any rights granted to you under this Agreement. Ramsey Group reserves the right to suspend, and/or to refuse any further access or use of the Website if Ramsey Group learns or reasonably suspects that your Registration Data is false or inaccurate, if you refuse to provide complete and updated Registration Data, or if you misuse or permit another to use your password who is not authorized to do so. Neither Ramsey Group nor its affiliates are granting or transferring to you or any other person or entity, by virtue of access or use of this Website, any title or any ownership rights or interests in any Information or Documents found at the Website or accessed or used through it, including without limitation any trademarks, copyrights, software, or other proprietary right or asset belonging to Ramsey Group. In addition, the hardware and software components, electronically-stored databases, and individual items within those databases that comprise the computer networks and systems that operate the Website and are used to make information available at the Website also belong to Ramsey Group, and also represent the proprietary property of Ramsey Group. In the event that you download software from the Website (which is limited to any situation in which such is expressly allowed), the software, including any files, images, and data accompanying the software (collectively, “the Software”) are licensed to you by Ramsey Group for your use in connection with the Website only. Ramsey Group reserves the right to modify this Website at any time and, in its sole discretion, may make modifications to the Website, including without limitation, with respect to information, documents, advertising, links, products, services and features found on the Website. You must comply with all applicable laws, statutes, ordinances and regulations regarding: (i) use of the Website; and (ii) release of information to and retrieval of information from the Website and any Ramsey Group database. To the extent that any applicable taxes apply to your use of the Website, including any sales tax(es), you are responsible for the payment of such taxes. As a condition of your rights to access or use this Website, you must use the Website and all documents and information found at the Website for lawful purposes only and only as expressly permitted in this Agreement. As a condition of your access and right to use the Website and information contained in the Website, and in addition to your other obligations under the Agreement as provided herein, you agree to not do any of the following, in any manner whatever, and your compliance is something that Ramsey Group, at its sole and absolute discretion, shall determine: (a) restrict or inhibit any authorized user(s) from accessing or using the Website; (b) impersonate any person or entity or false state or otherwise misrepresent your professional or other identity of affiliation or that of anyone else, or provide false, inaccurate or misleading information in connection with accessing or using the Website; (c) Use the Website for any purposes that are unlawful or illegal or that could give rise to civil or criminal liability or actions against Ramsey Group, you, or a third party; (d) Use the Website, or the information and or documents contained in the Website, for any unlawful or illegal purposes or post, submit, upload, email or otherwise transmit any information, documents, materials or communications at, to or thought the Website that would constitute a violation of, or engage in or encourage conduct that violations, any law, regulation or legal requirement or any local, state, national or international governmental entity; or (e) post, submit, upload, email, or otherwise transmit any content, material or other thing at, to or thought the Website that (1) is threatening, abusive, libelous, defamatory, obscene, vulgar, pornographic, profane, indecent, harassing, derogatory, rude, abusive, offensive, or hateful, or that may harm minors, or is unlawful in any similar or other way; (2) infringes or violates the rights of others, including without limitation, copyright, trademark, trade secret, or other intellectual property and proprietary rights, privacy or publicity rights; or (3) has an advertising, marketing, promotional, or other business or commercial purpose. WE PROVIDE THE WEBSITE AND OUR SERVICES AS IS, WHERE IS, AND WITHOUT ANY WARRANTY OR CONDITION OF ANY KIND, EXPRESS, IMPLIED OR STATUTORY. WE SPECIFICALLY DISCLAIM THE IMPLIED WARRANTIES OF MERCHANTABILITY, FITNESS FOR A PARTICULAR PURPOSE, TITLE AND NON-INFRINGEMENT OR ANY OTHER IMPLIED WARRANTIES. Ramsey Group SHALL HAVE NO RESPONSIBILITY TO PROVIDE YOU WITH ACCESS TO THE WEBSITE OR ANY OTHER SITE OR ANY DOCUMENTS, INFORMATION, PRODUCTS, SERVICES, TOOLS OR FEATURES OFFERED, ACCESSED, OR USED AT OR THROUGH THE WEBSITE OR ANY OTHER SITE. WE ALSO DO NOT GUARANTEE CONTINUOUS, UNINTERRUPTED OR SECURE ACCESS TO OUR SERVICES, AND OPERATION OF THE WEBSITE MAY BE INTERFERED WITH BY NUMEROUS FACTORS OUTSIDE OF OUR CONTROL. YOU USE THE WEBSITE AT YOUR OWN RISK. Our contracts with certain of our suppliers provide for scheduled maintenance and preventative, required and emergency maintenance work. We will have no liability for the availability of the Website caused by our supplier’s performance or lack of performance of the maintenance work to keep the Website operable. We will also not have any liability for any loss of data or transactions resulting from delays, non-deliveries, mis-deliveries or service interruptions caused by us, any third party acts or any other web host provider or the Internet infrastructure and network external to the Website. TO THE FULLEST EXTENT PERMITTED BY APPLICABLE LAW, IN NO EVENT SHALL Ramsey Group BE LIABLE FOR ANY DIRECT, INDIRECT, CONSEQUENTIAL, INCIDENTAL, SPECIAL, PUNITIVE OR EXEMPLARY DAMAGES, OR FOR ANY LOSS OF PROFITS OR REVENUE, RELATED TO YOUR USE OR INABILITY TO USE THE WEBSITE REGARDLESS OF WHETHER WE KNEW OR SHOULD HAVE KNOWN OF THE POSSIBILITY OF SUCH DAMAGES, AND IN NO EVENT SHALL Ramsey Group ‘s TOTAL CUMULATIVE LIABILITY UNDER THIS AGREEMENT EXCEED THE GREATER OF THE FEES PAID TO US BY YOU DURING THE TWELVE MONTHS PRIOR TO THE EVENT GIVING RISE TO THE LIABILITY, OR $500. THE LIMITATIONS OF LIABILITY PROVIDED FOR HEREIN INURE TO THE BENEFIT OF Ramsey Group, OUR AFFILIATES AND TO ALL OF OUR RESPECTIVE OFFICERS, DIRECTORS, EMPLOYEES, ATTORNEYS AND AGENTS. In the event that Ramsey Group takes any action against you to enforce this Agreement, Ramsey Group will be entitled to recover from you, and you agree to pay, all reasonable and necessary attorney’s fees and any cost of litigation, in addition to any other relief, at law or in equity, to which Ramsey Group may be entitled. The terms of this Agreement, as posted at the Website, constitute the entire and exclusive agreement between you and Ramsey Group regarding the Website and its use and superseded all other agreements, understandings and communications regarding the subject matter of this Agreement, if any, both oral or written, whether made prior or subsequently to or contemporaneously with your use of the Website. Ramsey Group retains the right to modify the terms or conditions of this Agreement at any time without notice or warning. You are bound to all changes Ramsey Group may make to these terms and, therefore, should periodically revisit these terms and review them to make sure you comply with all changes. 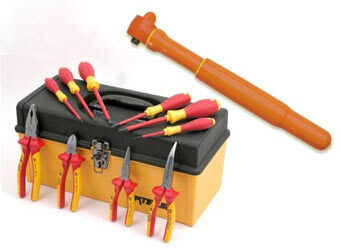 Insulated tools for safe work on electrical and electronic devices. 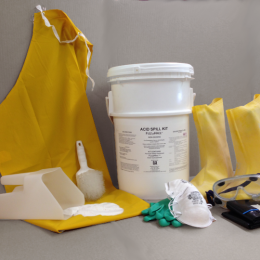 Ideal for service vehicles and cellular sites with spill exposure of 5 gallons or less.